Although most of us here are DIY guys, I am sure there are many who have thoughts about using a guide that visit this forum. I just wanted to share a couple of observations. At the very beginning of my elk hunting career, my dad and I hired a guide twice. The first time it was a okay experience (fantastic owner, actual guide wasn't so good, weather was horrible). The second time was a good experience all the way around. Both were back country horseback in quite a few miles type hunts. Traditional wall tents and the whole enchilada. If that is the type of hunt you want, do your research and I would highly recommend it. I would highly recommend either of the guides I used. Now we have been doing DIY for a while and this year while hunting we ran into 3 different guides quite a bit at the trailheads. Here is the problem I had with that setup, those guides were charging their clients $4500 to hunt from a trailhead that everyone was hunting from (I looked up their rates). In fact, we went in way further than they did. Their calling sucked (thanks Elknut for teaching me how to recognize sucky calling!!). I feel sorry for the value they got out of that hunt. I would suggest if you hire a guide and it isn't a backcountry hunt, you do a lot of research into how and where they will be hunting. I really wouldn't want people to spend that kind of money to just have them drive you to the trailhead many others are using. Sure, they got lodging, but yikes, that is some serious coin for what they got. I wont name any names here, I just want people who are thinking of hiring a guide to make darn sure what you are really getting, how and where you will be hunting and what you are getting for the money. I hope this helps someone! With Inreach and other quick satellite transceivers available, I would think drop camp hunts would be a good option for some Elknut types too. I never liked the idea of having a 7-10 day hunt where the wrangler came in on the last day. What would happen to my meat if I got something the first or second day? How would I get someone out if they got hurt? Anyway with satellite connection that is not the same problem. Potentially I could even stay longer if I wanted too. Probably Indian Summer has a lot of good ideas here. The only guide/outfitter that I recomend in Colorado is J Bar H Outfitters operating out of Meeker CO, hunting in Unit 12. Owned and operated by Jeanne Horne.If you think a woman can't run an outfitter business, you had best look into this one.Plus she is one of the nicest ladies you will ever meet. They kill a lot of good bulls from her drop camps and you can even stay in a cabin and hunt out of her base camp. You can go full guided or no guide.The guys swing by every few days and check your success to see if you need meat packed out. Great camps with good equipment, good livestock. Every camp is in prime hunting territory.The entire staff is courteous and knowledgeable. Plus you get it for a heck of a lot less than $4500. The only problem is getting signed up. Almost all her clients are repeat customers and it takes about two years to get hunt. I think she is about all booked up for 2017 and working on 2018 hunts. As an outfitter, who hunts like the average hunter when I have time I'd like to put in my 2cents. I have been part of outfitting businesses for 8 years. This year I finally became a co owner in a business. I literally started working opening weekend of archery season in Colorado for this new outfitter. This is the 4th outfitter I have worked for therefore I have seen all types of outfitters and how they operate. First things first make sure the outfitter is a legit outfitter, licensed, bonded, insured and permitted in the area you are hunting. This isn't nearly as common as it used to be but reprocautions can come back on you as the hunter, if you book and hunt with an illegal outfitter. Pricing- all outfitters can be different, some base pricing off of success rates, some base it off of services provided, some are a combination. Here's some things I have seen an outfitter with high success rates sometimes doesn't have great camps. Some have great camps and gear but success may not be as high. And a combination of high success and great camps is gonna cost more so make sure to ask about what is provided in your camp, success rates and ask for pictures of past clients with animals as well as clients you can call to see from them how it was. Some hunters won't tell an outfitter what was good or bad but an outfitter with high return clientele usually is doing something right. Success rates on a drop camp hunt can be a questionable subject, an outfitter can say we only had 10% success but he doesn't know how hard his clients hunted. With us we basically drop you off give you pointers and where to go, but if you sit in camp til 9 everyday hunt for 2 hours Come back and then go back at 3 for a few hours and come back ur success may be very low. And that reflects on a lower success rate for the outfitter. It's different than a guided hunt where the guide will most likely have you out all day, it's ur choice how hard you hunt. What is provided- this is something that may reflect pricing, some outfitters say 1 pack animal per person 145lbs of gear and 1 pack animal for food. Others will allow how ever you need. So if the outfitter doesn't provide cooking gear, utensils, tp, and that kind of stuff but limit you to number of pack animals you may have to skimp on gear or food. So finding out what is in the camp before you get there can have a huge impact on what you need or don't need. I have seen outfitters provide a tent, wood stove, small Coleman stove, axe, saw, and that's basically it. Therefore you then need to pack cooking gear, cots, chairs, food, personal gear, that can weigh a lot and take away from other things. Ask about resupply, and game pack out. Most outfitters will say we will check on you in 4 days from drop off to bring the last half of ur food. Some will only check on you once so if you kill the first day they may bring in your food for the rest of the week get ur animal and not see them til pack out day. Some outfitters will charge you more money to pack out game. Some will check on you every other day. It depends on what you can work out with your outfitter. So make sure to ask you don't want to kill first day then have no check in after that or kill and have an extra charge to get the animal out. Game pack out- when it comes to this find out what happens to your game after they get it, do they put it in coolers for you at ur vehicle til you come out, do they take it to a processor/taxidermist. Part of our policy is if you kill we come get it, it's part of what you paid for the camp, then will do as you wish with it, pack it in ice in coolers, take it to processor anything you need. We have been to a camp 4 of the 5 hunting days, 3 to pack game, 1 to resupply the camp. I have worked for an outfitter that charged $375 for every animal you killed to pack it out. The more the outfitter provides the more it may cost but a cozier camp could be a very nice thing if you're not having the greatest luck. Also don't go off of success rates for the past year alone, many factors can have an effect including weather, pressure, and season hunted. Ask the outfitter about their policy of a possible camp move half way if you're luck isn't right. Some may do this some may not, if the outfitter rides into camp and is pushing animals off the trail 500 yards from camp he's probably going to deny moving you. Ask about a possible day guide, we have done this as clients have said were just not doing something right can a guide come in for a day and show us area, give us pointers something like that and what they charge for the guide per day, it may be a pretty reasonable price especially if you are in a new area. Ask about summer pack trips to scout the area you are planning to hunt, if you have given a deposit some outfitters will give you a discount on overnight trips afterall you have given them a pretty good amount of money already. As said above the use of spot or sat phones, make sure to find out about cell service, rental of these things and all that. We have a few camps with cell service close to camp, others is impossible t find cell service. In my experience the spots are good but from my point of view as an outfitter I hate them. Yes the messages are custom but if you need supplies, I'm basically riding to camp to find out what you need, goin back getting it and then comin back that can be a 2 day ordeal for my guide. Sure having a message animal down is great I bring animals and come find you. But a sat phone is direct you can call and say what you need what's going on all of that. It's a lot better for me and the client. Sorry for the long post but I like helping people out and one bad experience can ruin it for a lot of outfitters, I love my job and am glad I have the opportunity to assist hunters. [quote="Gypsumreaper"]As an outfitter, who hunts like the average hunter when I have time I'd like to put in my 2cents. I have been part of outfitting businesses for 8 years. This year I finally became a co owner in a business. I literally started working opening weekend of archery season in Colorado for this new outfitter. This is the 4th outfitter I have worked for therefore I have seen all types of outfitters and how they operate. The whole post should be archived. great reply. I was going to tell how my uncle hired a drop camp in CO. He came home MAD the outfitter told him 7 miles on horse but forgot to mention 6 of the miles were along the road so he had people walk through camp every morning, never seen a elk. But GYP is right not all are bad outfitters. Gypsumreaper, that is an excellent post. That is the type of guide and outfitter that will make an enjoyable trip. The kind I ran into....that is a lot of money to drive someone to the trailhead and walk around with them all day. That is where I want to make sure people have some visibility. And if that is what they want, great, but go into it with your eyes wide open. I have been with lodge outfitters who do day hunts from their lodge in town basically, we do this kind of stuff in late seasons as more of a safety precaution due to snow. I've been with outfitters who have wilderness only drop camps. And with an outfitter who has a drive in camp through private access, then rides out every morning to hunt. All have advantages and disadvantages. A few of our camps you may not ever hardly see another person, some people may hike into but they have to get up 3 hours earlier than my clients to get to where they are, time where they can sleep in and stay rested. I have wilderness area as well as national forest, luckily my forest area is proposed wilderness which doesn't allow motor vehicles. That's another disadvantage is being in a camp that can be driven to publicly doesn't help your cause much as you paid to be taken to a spot that you could have gotten to yourself. As tigger said knowing what ur getting into is a big thing that's why I do suggest a scouting trip or even horseback ride in the summer. This is going to give you an idea of what your in for. Just a horseback ride before dropping any money can help you a lot, asking simple questions, where's their permits, how many camps, how do they access it all. Then if you are satisfied spending the money for a deposit. I've seen the good and the bad of it all, and have read forums about how outfitters are bad and all that, but outfitters are like poachers you don't blame every hunter for 1 poacher, so can't blame every outfitter for one bad one. This is an interesting thread to be sure. I have heard horror stories about outfitter/guides, especially drop camp services, but have only been on one guided hunt. It was a great experience and it was all it was claimed to be. On the other hand, there were other clients in the caribou camp too, and some of them were whining complainers and worse. I do believe if I get the notion to go on another assisted hunt, I will call Indian Summer or one of the professionals here on the forum, depending on where I want to go. After all: as helpful as they are, you know from the start they care about others and the sport they work at. Just my thought. I'm laughing. I think the only thing more misunderstood than outfitters is women. Tigger I want you to step outside the box. Away from your perspective for a minute. Ask yourself a few things you might not have considered. The very first one is did you consider the fact that maybe that is exactly the type of hunt the client wanted? There are people who want to hunt elk and are also willing to work hard at it but they see no reason to "rough it" like some of us enjoy doing. They may simply want a shower every night or the ability to set a thermostat to 70 degrees and go to sleep. There is a term for those kind of hunts. It's called day use. The opposite is overnite use which is when clients spend 24 hours a day on public land. 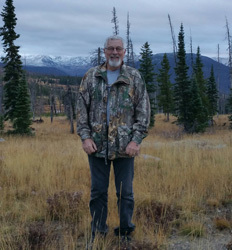 The outfitter is billed accordingly by the Forest Service. Some people would love to overnite but they just don't want anything to do with horses. Those guys might not only show up at the same trailhead as you but they may also be on foot. I bet you'd really shake your head if you thought a guy was staying at a hotel he could book on his own and getting picked up to go hike and hunt somewhere he could go on his own. But they do it. The reasons are obvious. No elk hunting experience. No knowledge of the area. The whole idea of gutting quartering and packing out an elk. A hunt I always liked guiding was late season. Like Thanksgiving week. Snow city! By then an outfitter would have to be clinically insane to have a wall tent camp standing. But more importantly he would be smart to have the ability to hunt per the conditions. Also the ability to check multiple honey holes and see based on the snow depths and temperature where in the whole staging and migrating process he can expect to find elk. But snow can make for tough hiking. Heck a little hill can make for tough hiking for an overdressed pilgrim. So taking horses to the trailhead is a great way to get a client where you need to as early as possible AND make sure that he has some gas left in the tank for more important things like hunting. I hunt a few places where hiking into elk from the truck is downright easy and guaranteed. But once there I have some plan Bs that are further in. I could get a hunter to them on foot. Once or twice. But to drag him up there 7 days in a row I can see us showing up late or taking a morning off. Instead I'll opt to get up early and get the saddles on the ponies. AND..... once we kill and elk I bust out the riding saddle panniers and the hunter who now has a second wind can walk downhill while we get his elk off the hill and avoid a return trip. Oh and by the way.... the one thing that I hated about those hunts was likely the opposite of what you'd think. They cost me more! Once my camp is set I'd much rather show a hunter his tent and cot than pay the hotel owner and the restaurant a tab at the end of the week not to mention the fuel. I have to agree with indiansummer, some clients want the hunt where you are driven to the trail head and ride in for day hunts. This is usually the type of hunt we do late third and fourth rifle here in Colorado. We call them day hunts and you pay by the day. Usually when we have a lot of snow we don't want tents set up 4th it's dangerous for clients, my horses, guides and destroys my gear if we have a usual snow year. This year we had a guy call during archery season for a 1 day hunt he hunted 9 days by himself in a different unit and didn't even see elk. We took him out for a day met at the ranch at 4:30am, hit the trail and hunted all day then ended up harvesting a 300" bull that evening. It was his first elk hunt ever, he was hunting area he'd never been to, and just wanted a little help to try and harvest. He needed his hunt filmed as well for the outdoor channel. 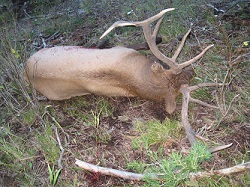 2nd season had a gentleman in somewhat the same situation although he had been hunting this unit for 15 years, he was older and just tired of walking, went to the trail head took him in and we hunted we would have gotten into elk but he wanted a 320" + bull and ended up giving up around 1pm. Some people just want that little help, or the horses to save their legs a little. These hunts are as Indian Summer said a little more of a pain than a fully guided week hunt for my outfit at least. And as he said sometimes these hunts are great cause you can cover a lot more country in the few days they hunt rather than being based in one spot, I could hunt a ton of area based out of a day lodge hunt which keeps us a little more mobile but also can rack up a rather large bill with dinners in town and all that which in return drops out profit margin down a ton. And then there's the fact that myself and lots of others could hunt any way we choose and what do we do? Leave from a trailhead on a horse where other hunters are heading to nearby spots. I pay to rent them too just like a guided client. But unlike them I also have to get up to feed brush saddle and water mine. I could hike from the trailhead. I've done that plenty of times and still do. I could set a camp on the hill somewhere but I don't like to camp where I might see elk which could be just about anywhere. If I thought it would help me kill a bull I would certainly pack a camp in. I mainly take horses to pack elk out but having them hike me up the hill in the dark each morning is nice bonus for sure. I get to take my spotting scope and a few other things that I might eliminate if I was on foot. As a guide I'd drag a pack horse so I can toss the hunters daypack in it. If he is old I might even take a small folding chair to set him up on. He might think I was just a nice guy which I am (grin) but my thought is it will make him sit still instead of shuffling around to get comfortable and maybe get busted. Last but not least yes.... my hunter will have a better chance to kill and elk than if he was on his own AND most likely better than anyone else leaving that trailhead regardless of their mode of transportation. Not all but most. 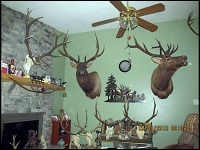 And then there's Paul the Elknut..... what does his crew do? Hike into public land from a roadside tent camp. In my opinion a packed in wall tent, although it can mean great hunting, is more for the atmosphere and experience than it is anything else. I surely love the experience as much or more than anyone. If someone else was going to pack in camp and set it AND pack all the crap back out while I'm packing elk, I'd hunt from it in a heartbeat. Otherwise I'll see you at the trailhead in the morning. I too now camp at a trial head and ride in every day. Mostly I have a 100% success rate in killing an elk every year. The last three years I have killed two bulls and one cow. I went from a small tent and minimum camp when I was young,to a full blown wall tent, elk camp style, to a slide in camper on my pickup . The wall tent camps were just as comfortable, but by God they are a lot of work. Usually three full pack trips in and out. Now I pull in,crank up the camper, light the fridge and set stuff out.I have a thermostat controlled heater, stove, and freezer to keep my food frozen until I need it..In ML season, I even have a shower tent set up. I have a warm comfortable bed,and eat good meals every day.None of this eating out of a plastic bag stuff/. In the AM, I have the alarm set 10 minutes early. It goes of, and I can reach the thermostat without getting out of bed. Turn it up ,get the camper warm, set the coffee on and it's ready by the time I get done feeding the stock. I ride in every morning in the dark, 4-8 miles.I can hunt as hard as I want and only need enough energy to crawl back in the saddle.Having horses or mules,whether it is in packed back in camp or at the trailer head is certainly more work. However,I can hunt an 8 mile radius is any direction an do it 9-10 days in a row. This is great information for me considering I am looking into these types of hunts for next year. Keep it coming! Old guy getting back into hunting after 40 year layoff! 2. What mode of transportation is used to get from the sleeping bag to the area that will be hunted? If the answer is a combination of ATV/4X4/Horses/walking, etc I would recommend a bunch of follow up questions. 3. How will a potential elk be hauled out? 4. How far from the trailhead (or camp) will we hunt? 5. What is the hunting pressure like? 6. Will we see/compete with other hunters? 7. One other one I asked was references from unsuccessful clients. I figured if the guy didn't get a bull and still recommended the outfitter, that was a pretty darn good reference! Sounds like there is a lot of interest in this topic, maybe the egg-spurts can chime in with some additional questions that a prospective client should be asking. One of the most important questions was ommited. Will you be hunting on private land, wilderness area, or open national forest? I'll add in a few questions that I like to tell clients even if they don't ask. 1. What type of terrain will I be hunting? 2. If fully guided for a week or drop for a week and we tag out early what then? Can we stay in camp and spend the rest of the week hanging out? Do we have to leave if we tag out? 3. If fully guided and I tag out day 1 do I still get to go along? 4. What do you provide in drop camp/fully guided? 5. A list of do bring and don't bring items? 6. Cell phone service, spot rental or sat phone rentals? 7. This one is kinda iffy but for archery guys does the outfitter allow mechanical broadheads? I know some outfitters will not allow you to hunt with them. 8. If ur a long range rifle hunter ask if the guide will allow you to shoot long distance or if you can show up early to prove your capabilities. 9. If you're doing a drop camp you can always ask for a general idea of the permit area, some outfitters may allow you to choose an area you'd like to hunt and have a camp there. 10. Policy on moving to a different camp if you become over run with hunters or something like that. Some outfits may do this some may charge extra some may not. But don't go in Friday hunt Saturday and call Saturday afternoon and say we're not seeing anything can we move? There are so many questions you can ask that it's hard to pertain to general questions as every outfit has different policies as well as hunting styles. My stuff is all horseback and walking which makes my policies a little different than someone who may have access to driving around then hiking. I would be interested in something along the lines of a day or two of guided then go out on my own. I don't have an unlimited amount of time or resources for scouting and as my screen name implies, I am a novice at this. I saw on some of the above posts that guides would be responsible for meals, etc at lodges. How about if I already have my own lodging/meals and just need the guide and horses or such? I have pretty good accommodations available to me in some places for near free, such as Steamboat Springs, Granby, Vail, etc. I could meet a guide at the trailhead at the appointed time no problem. Are there any services that do this kind of thing?